I don't know if any of our readers actually enjoy getting "Ad Mail" in their post office box but I can tell you that I can't stand it and usually can't wait to tear it up. The key word in the previous sentence being "usually", because there is one exception to my rule. "The Trius Touch" is advertising in a newsletter format that I look forward to getting because of the photographs and stories on the back page written by none other than former hockey Tommie standout and successful businessman R. Gordon Wheaton, to his friends Gordie. While the point of the mail out is to highlight the business he runs, the brief but highly entertaining stories that Gordon writes help the reader to see how and why his business is successful. He has never forgotten where he came from and how he got to where he is today. You can read how appreciative he is of all that he has and to those he serves, as well as to those he gives back to. As a Gold sponsor of St. Thomas Athletics, I thought that highlighting his contributions would be fitting. 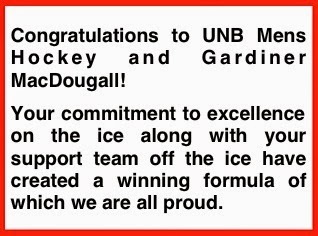 It would take a complete incompetent moron not to see what this man means to our program, and probably more importantly, to our Fredericton community. I would like to focus some of the great features that Mr. Wheaton has written about and add links to the "The Trius Touch" so you can see the whole article for yourself. The notice to the left was in issue number 22. A former Tommie that would have had fought a bitter rival for four years on the ice takes the time to congratulate a local team on a job well done. He knows success when he sees it and wants others to appreciate it as well. Everybody that reads this blog knows how much I personally hate UNB but this note says so much about the man behind Trius Inc.. Success doesn't come easy and he talks about his road to it in this article. It takes good people to make it happen. 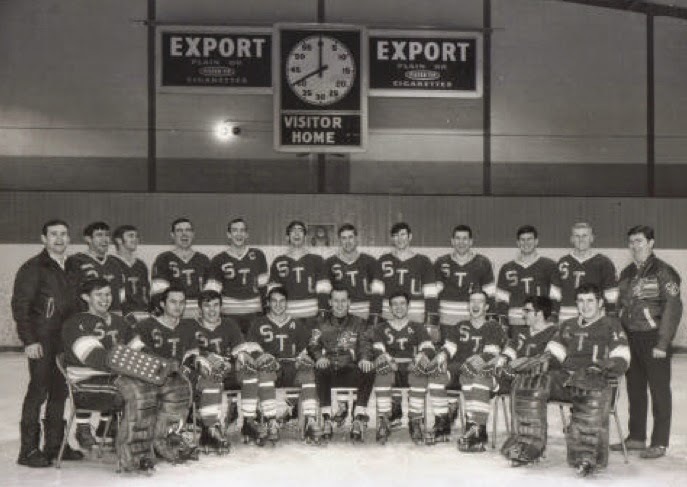 The photo on the right is the 1968-69 St. Thomas Tommies. This team went all the way to the AUHC finals and lost a hard fought series to the powerhouse Saint Mary's Huskies, coached by Bob Boucher. Gordon reminisces in issue number 20 about the photograph and the good times he had. He also talks about teammates and the wonderful connections he has made over the years. A tap of the stick goes out to the coach that recruited Gordon to St. Thomas. 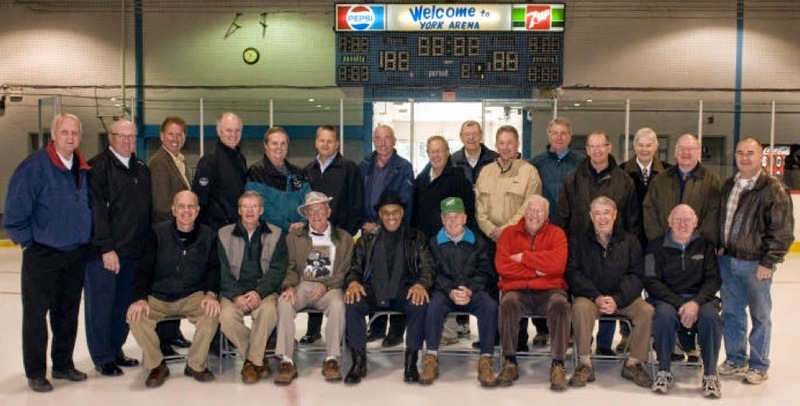 In issue number 21, Gordon talks about the York Arena and its connection to Fredericton. Look at the Tommie and UNB hockey connections in this photo. Three former St. Thomas hockey coaches, at least three Tommie players and not to mention HUGE Tommie and UNB supporters. Some of these guys in this photo are a big reason why UNB are on top today. This was just a taste of what Gordon Wheaton has included in his "Ad Mail". Please check out the back page of all of the issues for more great business and personal stories and THANK YOU SO MUCH, Mr. R. Gordon Wheaton from Fredericton Hockey Fans!!!! !